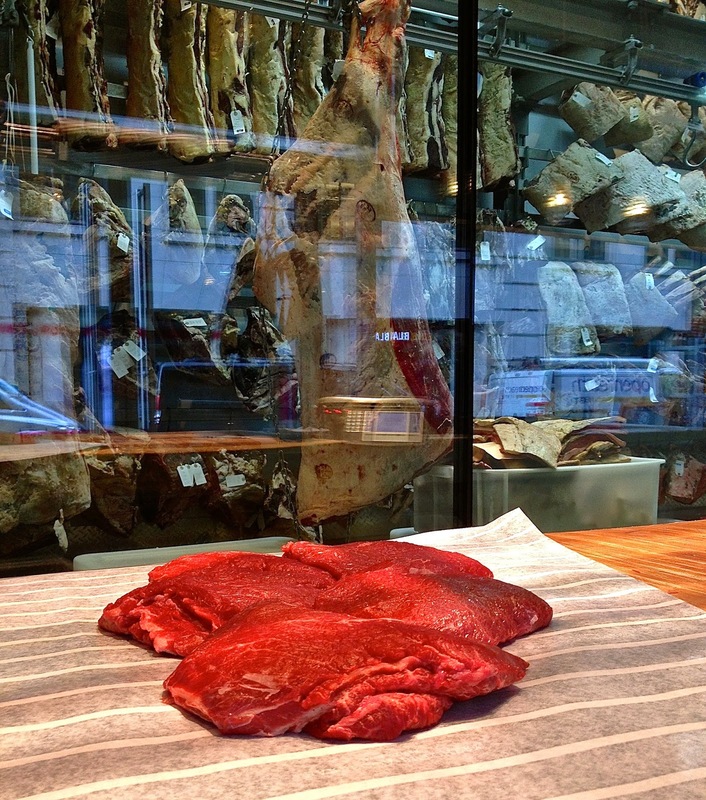 The good people at Grasstronomy (Irish Beef) got in touch asking me to put together The London Foodie readers’ favourite beef dishes, the ones you love cooking at home. I love a good steak, but it was the words “Irish Grass Fed Beef” that really caught my imagination. So how could I resist? It was tough choosing a favourite among the mouth-watering replies from Twitter, Instagram and Facebook (thank you folks for participating! 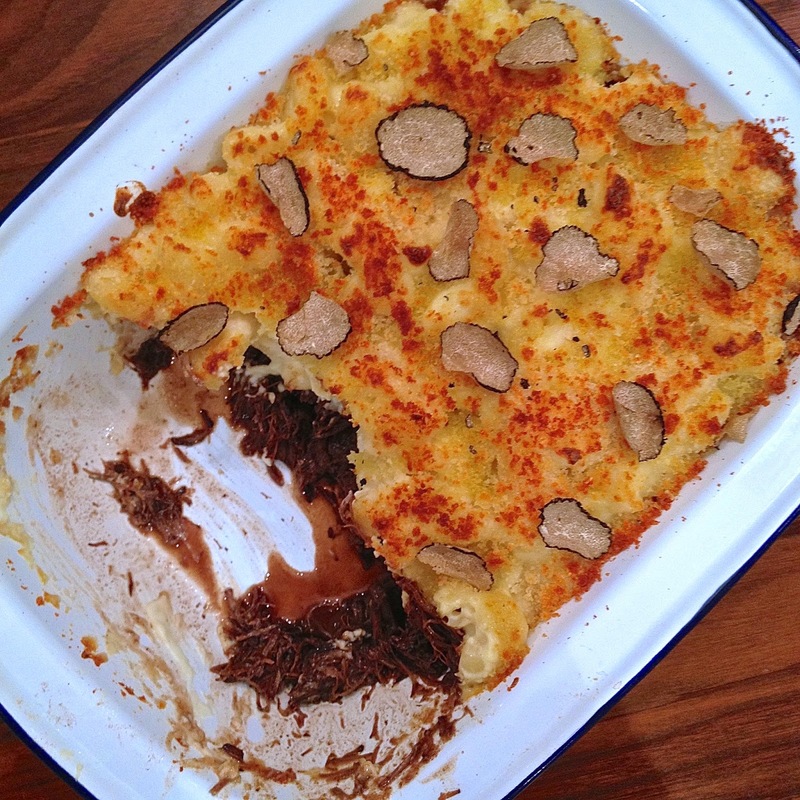 ), but in the end I chose an irresistible Ox Cheek Mac n' Cheese! 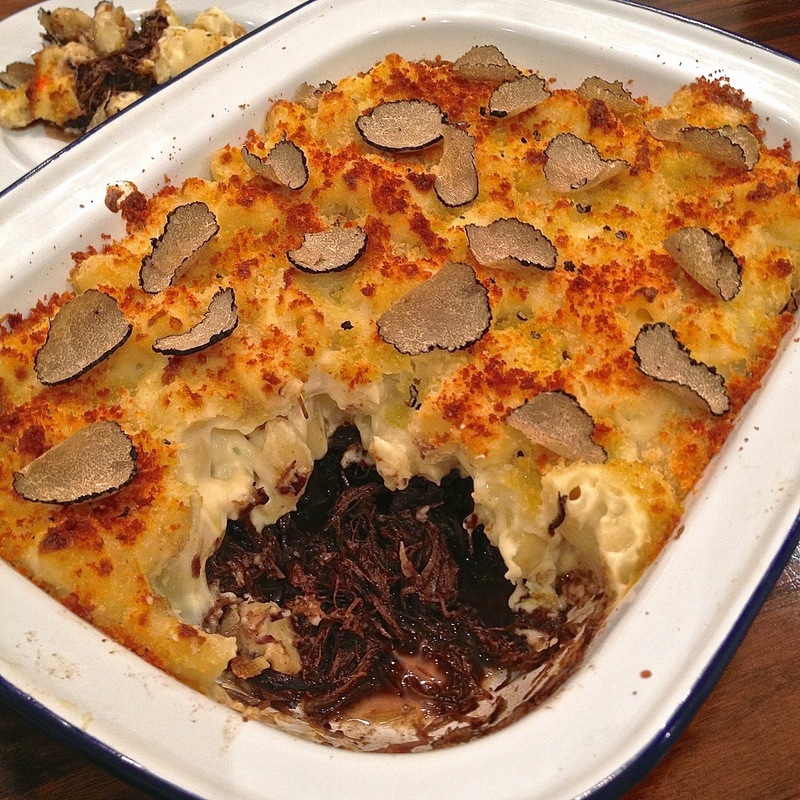 This heart warming and luxurious version features slow-braised Irish ox cheeks cooked in red wine and spices, topped with macaroni cheese flavoured with mature Parmesan and fresh black truffles. 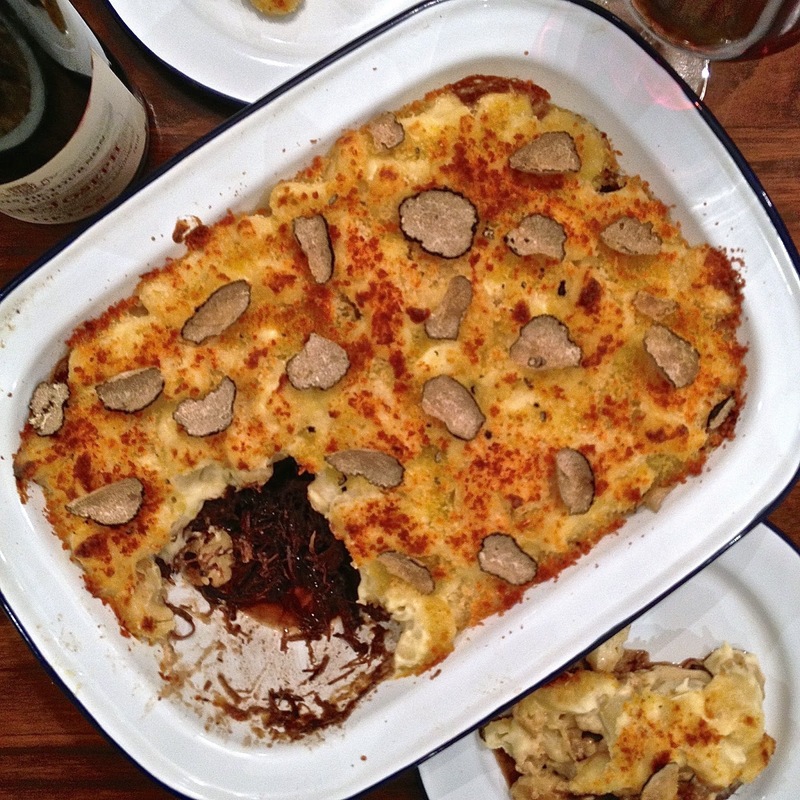 Perfect for the colder months, this is comfort food at its best! So why all the fuss about Irish grass fed beef? Ireland is blessed among other things with rain, all year round, and this makes for terrific pasture and a rich soil. Grass fed cattle are also thought to be leaner as they work for their food. And it’s reputedly this sweet grass of Ireland that makes some of the most luscious, tender beef in the world – tried and tested, right in my kitchen. If you would like to learn more about Irish grass fed beef, visit the their website here or on Facebook here. Better still, why don’t you try Irish grass fed beef for yourself? Next time you visit your supermarket or local butcher, look out for Irish beef and try out the recipe below, I look forward to hearing what you think! Remove any gristle or nerves from the ox cheeks, cut them up into 5cm pieces, season with salt and pepper, and keep aside until needed. Peel and wash the carrot, onion and celery and dice them into 1cm cubes. Finely chop 2 garlic cloves. Pour the red wine into a saucepan, bring to the boil to burn off the alcohol, add the mixed spices - 1 small stick cinnamon, 1 star anise. 1-2 cloves and 10 black peppercorns and reduce by 1/3. Heat a casserole with the olive oil on a high heat, brown the ox cheeks on all sides, remove the pieces from the casserole when done. Lower the heat, add 25g butter into the casserole, let it foam (but not burn), then add the diced vegetables and garlic. Sweat the vegetables until lightly coloured for about 3-5 minutes. Turn up the heat, add a few tablespoons of the spiced red wine and deglaze the pan by scraping the juices from the bottom of the casserole with a spatula. Return the browned ox cheeks back into the casserole and cover with the remaining spiced wine so that the meat is covered. Bring gently to the boil, cover and place it in a fan-heated oven for 6 hours at 180°C, turning the meat occasionally during cooking. Alternatively, use a pressure cooker at high pressure for 2 hours. Once cooked and very tender, remove the beef with a slotted spoon and place it on a deep tray (if using a pressure cooker, ensure to release all pressure before attempting to open the pressure cooker). Shred the beef. Pass the jus through a fine strainer into a clean pan, and reduce it slowly until a thick and smooth sauce is achieved. Add the sauce to the shredded ox cheeks, mix well and check for seasoning. Set aside until needed. Finely grate all cheeses, keeping them separate. Tear the bread into pieces and whizz in a food processor to coarse crumbs. Mix 25g cheddar and 25g Parmesan into the breadcrumbs. Toss the rest of the cheese together in a bowl and set aside. Pre-heat the oven to 190°C. In a large pan of salted boiling water, add the macaroni cheese and cook al dente according to package instructions (roughly about 8 minutes), stir occasionally to avoid them sticking together. While this is cooking, start the sauce. Warm the milk and single cream in a small pan. In a separate pan (big enough to take the macaroni as well), melt the butter in a pan, then stir in the flour. Cook for 1 minute, stirring, then take off the heat. Pour in 1/3 of the warmed milk and cream mixture and beat well with a wooden spoon until smooth – it will be quite thick at this stage. Add another 1/3 – it may go a bit lumpy, but keep beating well and it will go smooth again. Pour in the final 1/3 and keep beating until smooth, a balloon whisk can also help you with this step. When the macaroni is done, tip it into a colander and drain. Put the pan with the roux mixture (butter, flour, milk and single cream) back on the heat and cook, stirring, until thickened and smooth. Lower the heat and simmer for about 4 minutes until glossy, stirring every now and then. Remove from the heat and stir in the cheese and mustard, mix well. The consistency of the sauce should be rather thick. Check for seasoning and adjust if required. Gently stir the macaroni into the sauce and stir to coat completely. There should be enough sauce to coat the macaroni thickly and liberally. Lightly reheat the shredded ox cheeks and cooking juices and place them in a casserole (large enough to take in the macaroni cheese, and one in which the final dish will be presented at the table). Gently top with macaroni cheese mixture, scatter over the cheesy crumbs over the top and heat through in the oven for about 12 minutes or until beginning to bubble around the edges. Grill for 3-5 minutes to brown the crumbs to a light golden colour. Remove from the oven, drizzle 2 tbsp of good quality truffle oil, let it rest for 2 minutes, then scatter the fine slices of fresh truffle over the dish and serve immediately. India Pale Ale - The Belgian Connection?